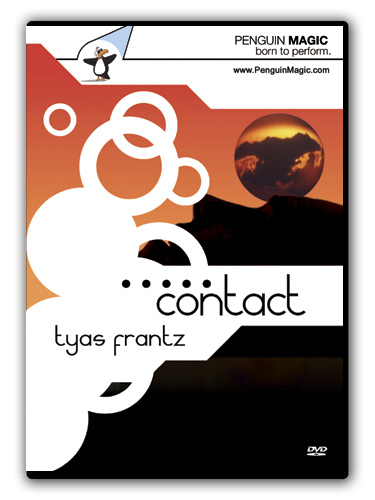 Today, when you order "CONTACT Starring Tyas Frantz", you'll instantly be emailed a Penguin Magic gift certificate. You can spend it on anything you like at Penguin, just like cash. Just complete your order as normal, and within seconds you'll get an email with your gift certificate. 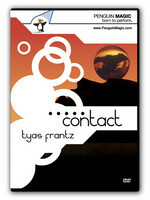 CONTACT Starring Tyas Frantz (DVD) Go From Beginner to PRO in Contact Juggling in ONE DVD! Order in the next 1 hour 31 minutes and it will ship TODAY! Contact Juggling, also referred to as CJ or Dynamic Manipulation, is the art of manipulating one or more objects while keeping them in contact with your body. In Contact Juggling, balls are rolled over the hands and body in visually interesting patterns instead of being tossed in the air. Contact Jugglers perform with a wide variety of objects from pens to basketballs (Harlem Globtrotters), but the most popular object is the 3" acrylic ball. Contact balls are transparent, so they never appear to be spinning. This property allows the performer to create a mesmerizing effect wherein the balls appear to be sliding or floating accross the body. It's that element that attracts magicians to Contact Juggling. Indeed, good Contact Juggling looks a lot like magic. Special bonus: Sit with Magic Historian Paul Draper as he interviews Tyas in the Penguin Magic studio. Contact Juggling has been done in various forms for centuries. Contact Juggling in its modern form was pionereed and popularized by Michael Moschen, the genius of physical coordination and choreography. Michael Moschen brought Contact Juggling to the public's attention when he performed as a hand-double for David Bowie in Labyrinth, a 1986 Jim Henson film. Michael Moschen has done so much to develop this artform that some experts have said Contact Juggling should be called "Michael Moschen Juggling" instead. Please Note: In this DVD, Tyas performs with up to FOUR 3" Acrylic Balls simultaneously. These are the recommended balls for Contact Juggling, and they're fairly expensive at $ 27.99 each. We recommend that beginners purchase the DVD and start learning the moves with a lacrosse ball, a billiard ball, or even an orange. You can Contact Juggle with any smooth and solid ball that's approximately 3" in diameter. Once you've mastered the moves you can easily switch to clear acrylic balls. I'm pretty shocked at all the good reviews for this dvd. I think they must be coming from people who have just been introduced to contact juggling and are still on that initial "high" they get from seeing something so cool. The DVD? It's not good. If it was aimed at beginners, it fails to teach the basics. Not only does it fail to teach isolations or one-ball moves (there are about 3 on the whole dvd) but it doesn't even help guide you in what ball to get as a beginner. If it was aimed at advanced, it is lacking in multi-ball patterns, stalls, and more. Better bet? Buy a Fushigi. You get a great ball (3 inches) for beginning work AND the DVD provided is fantastic compared to this one (and all for just $20!!). Sorry, but this DVD was not good at all. Sure, you CAN learn a few moves, but there are many other resources that are better (and cheaper!). I am very sorry to say this but I am a juggler (and contact juggler) before being a magician and I do not think this dvd is worth getting. The only positive thing is that it introduces the contact juggling to magicians. But the caracter is not entertaining (personally), the tricks are only basics and they are badly executed. If you really are interested in contact juggling you should really go for "contact juggling" (part 1 and 2) of Maldonaldo, Edson and Holwick, or the brand new "In isolation". Once again sorry to say bad things about a penguin's dvd because most of their products are great. This DVD was my "introduction" to contact juggling. I almost gave up on it after watching this video. He skips over most all of the beginner stuff. He doesn't spend that much time on advanced stuff...To be honest I am not sure what skill level this is intended for. By trying to make a DVD to serve everyone, CONTACT has succeeded in creating a DVD that serves no one. My advice, by a ball and do a quick google search for a Contact juggling forum...there is only one that i know of...You will learn so much more from the knowledgeable people there--and its free! This DVD Tutorial is... eh... let's say it could be better. Tyas really doesn't give you the "umph" you get from other video's like Fushigi. Tyas seems a bit stiff working with the Acrylic Ball, like he learned it maybe a year ago, less fluid than those with more time under their belt. Don't get me wrong, he's very talented, but it doesn't seem fluid (like Michael Motion from Labyrinth) and he seems distracted throughout the instructions. Otherwise it's ok, I gave it 2 stars due to the fact that he seemed to be pressed for time instead of taking the time and care to teach you how to Contact Juggle; pretty much you do not learn "fundamentals" or get any kind of assistance (you will struggle, it takes lots of practice... I recommend getting hand and wrist strenghteners prior to its arrival) with the basics nor the advancement. This just seemed like a "look what I can do" video and if you just keep practicing it'll work for you too! If he was more in depth with ideas and ways to make the basics easier to learn and showed more attention to those buying the video instead of constantly glancing off and smiling at someone or blowing off the precision of moves by saying "if you practice you'll get it" I might have learned more and understood the mechanics. This is decent if you're wanting to see how it's done, or you could just put Labyrinth in slow mo on the Michael Motion parts and pretty much get the same instruction. Contact juggling was something I was keen to learn just for the sake of being able to do it. This DVD is a really good DVD for newcomers because it covers the essential moves and teaches you how to grow confident with handling the contact balls. If however you're keen to become a contact juggler and are aiming for a high standard I think there are a few other specialist DVDs on the market which would be better for you (ones which go into a lot more depth). If you're a newbie and want to learn this just for the sake of learning it then this is for you. This isn't really a magic trick but it is a great, entertaining skill that will baffle people. Some of the moves are pretty easy to learn, while other moves will take a lot of practice. If you are serious about learning this and are willing to put in the time, then pick this up. Like the coin roll, and just standard juggling, it's something you can do to capture the attention of your audience. Pick this up and you'll be glad you did. this isnt my type of magic, but a friend got it for me as a gift and i have loved it ever since. it is such a graceful and beautiful "act" that will grab the attention of anyone on the streets. it is well taught. combine this into your magic act and you have a great routine! Tyas made me unafraid to drop my contact juggling ball. If there is one great positive point that I got from this DVD it would be this: It's ok to be a beginner at something. Tyas has taken me from knowing nothing about contact juggling to being to perform all the basics. I still have no problem entertaining random strangers with my simple and humble contact juggling manipulations. This is a good DVD for those who would like to step into the world of contact juggling. Do not buy this if you are already acquainted with the skill. This is like the first taste of a life long addiction to little see-through spheres. I will say that I was happy when I received this dvd, but not that impressed. While Contact does have some strong points, it lacks so much and leaves the viewer hungry for more. 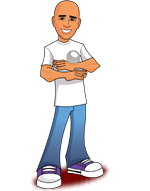 -Tyas' teaching style is very light hearted and easy going. I'm actually suprised he hasn't released more dvds on penguin magic, for he is a superb instructor. -There is a watch and learn section that repeats the same move over and over again. I first thought this was a waste of time, but the more I wanted to perfect my juggling, I found myself going back to it to get the moves right. -The interview with Tyas on the bonus material was very informal. Giving some history and also some sources for contact juggling. -There are not that many tricks. I really think I could've used more single ball moves. -Too short. WAY too short. The dvd is finished in about 30 minutes. I would say the price is a just a bit too much if it weren't for the bonus material. -I would have love to see more footage of Tyas performing on stage. Even just some more clips would have been good motivation for us beginners. If I could, I would give this dvd a 3.5 out of 5. While it's a great starting point, it's just a bit incomplete. All in all, the price is a bit much but worth it, and for learning a beautiful art with a great teacher, you might give it a shot. Tyas recommends that people don't start with a clear acrylic ball. Most beginners are so paranoid that they'll drop it, and for me, this couldn't be further from the truth. Besides an acrylic ball, I also bought some rubber balls, which are excellent to practice with. You can find out what ball size is right for you, and if you drop them (and believe me, YOU WILL), you'll be able to catch them on the bounce if you're on pavement or a wooden floor.